Background: There has been rising burden of childhood obesity in most developing countries despite high prevalence of under nutrition. Obesity is associated with abnormal lipid levels that could result in a variety of metabolic and cardiovascular complications. Objectives: To determine the association of body mass index (BMI) and lipid profile in adolescents in Enugu metropolis. 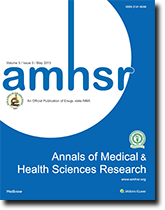 Methods: A cross – sectional analytical study was undertaken among children aged 10 -18 years old who were selected using multi-stage sampling. BMI and BMI percentile were determined while fasting serum lipid levels were determined using enzymatic methods. Data was analyzed using SPSS version 20.0 with level of statistical significance set at p < 0.05. Results: Three hundred and fifty children aged 10 to 18 years were studied. 2.6% and 10.0% were obese and overweight respectively. The prevalence of the different abnormal lipid profile including hypertriglyceridaemia, low level of high density lipoprotein cholesterol (HDL-C), hypercholesterolaemia, and high level of low density lipoprotein cholesterol (LDL-C) were: 13.4%, 9.4%, 6.3% and 5.4% respectively. Hypercholesterolaemia, hypertriglyceridaemia and increased LDL-C levels were significantly associated with increasing body mass index in the study subjects. Conclusion: Overweight and obesity is common among the study subjects and those with higher BMI particularly the older ones tend to have abnormal lipid profile. Recommendation: Assessment of BMI should be incorporated into school health programme and those with overweight/obesity subjected to routine lipogram in order to timeously apply preventive as well as therapeutic measures in order to save lives.